The Trump administration has awarded $24 million in grants to a small New England nonprofit group with ties to President Donald Trump’s opioid czar, Assistant Secretary for Mental Health and Substance Use in the Department of Health and Human Services — Elinore F. McCance-Katz — a WhoWhatWhy review of government documents reveals. The American Academy of Addiction Psychiatry (AAAP), based in East Providence, RI, has been awarded $12 million per year for each of the next two years — the largest government grant the AAAP has ever received, an analysis of government records shows. AAAP will be paid to provide technical assistance for programs designed to help states cope with the opioid epidemic. The grant comes through the Substance Abuse and Mental Health Services Administration (SAMHSA), an agency run by McCance-Katz. She is the AAAP’s former president, one of its 26 distinguished fellows, and was, until recently, an associate editor of its in-house journal. The grant also comes at a time when McCance-Katz is slashing spending to other outside providers as part of a decades-long struggle over differing approaches to mental health. The AAAP approach is the “medical model” of mental health. (See below). It leaves AAAP as one of the few technical advisers standing. And, because AAAP’s role comes through a grant, it cannot be appealed in the same way as a contract award might be. In a statement sent through her agency’s spokesman, McCance-Katz rejected any suggestion that she had influenced the grant decision. Opioid abuse and addiction have arguably become America’s worst public health crisis since the early days of the AIDS epidemic. Every day, nearly 115 people die from an overdose, according to federal statistics. Nearly 50,000 Americans died from opioid overdoses last year. That’s almost as many Americans as were killed in a decade of war in Vietnam. The opioid crisis is also an issue that the Trump administration cannot afford to mess up. The president’s “American carnage” rhetoric was aimed at the epidemic’s victims — at least one 2016 study found that Trump’s biggest support came from places most stricken by opioids. The nomination of McCance-Katz was taken by many — including some critics — as a rare sign of seriousness by the administration. A psychiatrist trained at the University of Connecticut and Yale, McCance-Katz has spent most of her adult life treating addiction. From 2013 to 2015, she was the first full-time chief medical officer at SAMHSA. She is now the first person ever appointed assistant secretary for Mental Health and Substance Use at the Department of Health and Human Services, a near-Cabinet-level job created by Congress in part to respond to the opioid crisis. 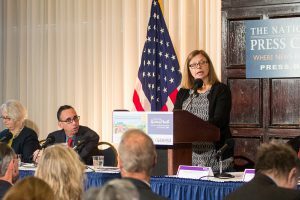 McCance-Katz has been a champion of the so-called “medical model” of mental health — where the emphasis is on medicating and even hospitalizing people with mental illness or addiction. Her appointment raised concerns among other practitioners who support what is known as the “recovery model,” addiction treatment that emphasizes more community supports — like job-training and placement — and strengthening family ties. 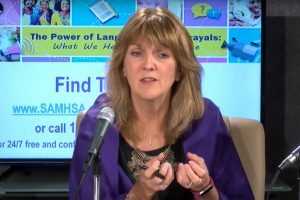 McCance-Katz followed up her January statement with a blog entry posted on SAMHSA’s website in late March. In it, she announced that she was cutting contracts to technical assistance providers that had helped the agency administer grants for decades. Within hours of the blog’s posting, dozens of companies received notice that their contracts would be terminated, one contractor told WhoWhatWhy. The Professional Services Council, a trade association that represents government contractors, is “troubled” by McCance-Katz’s decision, council spokeswoman Ashlei Stevens said in an email statement. Billions are flowing out of Washington in the midst of a national crisis, and the disruption caused by sudden contracting changes could “harm SAMHSA’s ability to achieve its mission outcomes, and ultimately erode needed capabilities that support the agency’s important work and the millions of American families that depend on it,” Stevens wrote. For communities that have been ravaged by opioids, medicine alone isn’t the answer, said Natalie Andrews — a licensed clinical social worker in rural Illinois, where opioids are now responsible for more deaths than homicides and car crashes. “This is a public health issue. It’s a public health epidemic,” Andrews said. Andrews has lobbied for medicinal interventions and seen them work effectively. But opioids are tearing holes in the social fabric of small towns, and kicking addiction is merely one patch. Addicts often need job training — not to mention jobs — so it’s “not just rehabilitation and recovery” that need government focus, “it’s how do we rebuild lives?” Andrews said in an interview with WhoWhatWhy. Whatever the merits of the medical-versus-recovery argument, the new grants are a boon to the AAAP. The $24 million in opioid grants is nearly twice the total amount of grants the group received in the previous 15 years combined, an analysis of government records reveals. According to the academy’s most recent tax return, the group handled fewer than $2 million in federal grants in 2016, disbursing about $800,000 to other organizations. Its payroll was around $622,000 and its highest salary went to Executive Director Kathryn Cates-Wessel, who was paid nearly $186,000 in 2016. Like McCance-Katz, Cates-Wessel lives in Rhode Island. The two also worked together on a planning committee at Brown University’s Office of Continuing Medical Education. Cates-Wessel did not respond to requests seeking comment. Three of the addiction academy’s four largest federal grants have been awarded while McCance-Katz was at SAMHSA, government records show. When Trump nominated McCance-Katz last year, few spoke out against her. One exception was a conservative Congressman, who might otherwise have been one of McCance-Katz’s staunchest defenders. Then-US Rep. Tim Murphy, a Republican from Pennsylvania, had co-authored the legislation that created McCance-Katz’s new job, had advocated for the medical model of mental health for years, and had been one of Trump’s most loyal backbenchers. 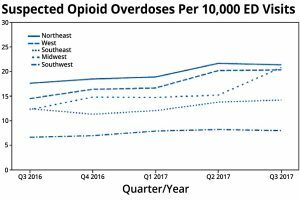 Meanwhile, opioid casualties have continued to mount. Emergency room runs for opioid overdoses grew by 30 percent between July 2016 and September 2017, the most recent federal statistics show. 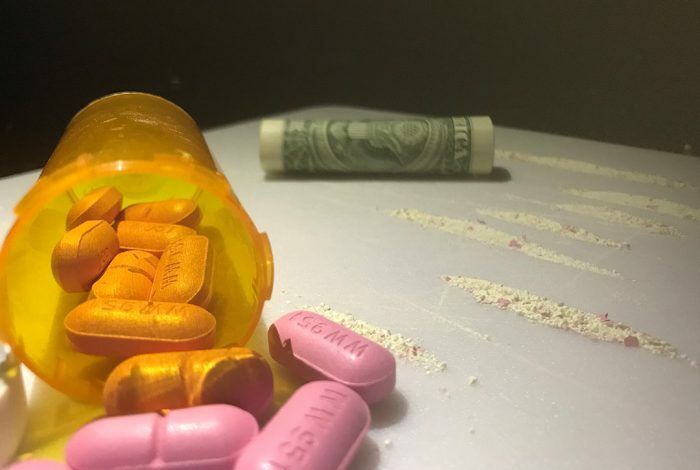 The Midwest saw the biggest increase in overdoses, at 70 percent, but overdoses in big cities leapt by 54 percent over the same time, the government says. Bill Myers lives and works in Washington. Email him at myers101@outlook.com. He tweets from @billcaphill. Related front page panorama photo credit: Adapted by WhoWhatWhy from Donald Trump (The White House).